The Millcreek SS…. a true innovation in manure spreaders! What does a stainless steel (Type 304) body mean? Often if the body rusts through, it’s time for a new spreader. The new Millcreek SS body is guaranteed not to rust through for LIFE! You’ll get worry-free operation, heavy-duty service and durable construction. There’s nothing else like it! Dread stall cleaning? That heavy wheelbarrow is so hard to push, and even harder to maneuver out of the barn. Then the mighty backbreaking heave to dump it on the pile. That stinky old fly-infested manure pile! FORGET ALL THAT – Here’s a better way! 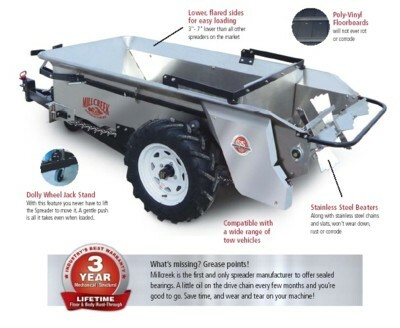 Your garden tractor,ATV or utility vehicle pulls a Millcreek Spreader right to the stalls. Or, easily push the Spreader using our exclusive Dolly Wheel Jack Stand.™ With this feature you never have to lift the spreader to move it, even when fully loaded. No need to filter out hay or straw because our spreader handles it all. With the Spreader attached to your vehicle, you drive to the field or pasture, engage the Feather Touch Levers™ and presto, you’re recycling natural fertilizer. Better yet, you’re done with your stall-cleaning chores in less time – leaving you more time to enjoy your horses!